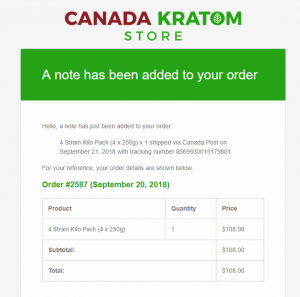 Canada Kratom Store’s website is easy to navigate and find the products I’m looking for. Everything is on the home page and one click away. Placing an order is straightforward with no account required. There is free shipping as well as additional express options. Their combo packs are a great way to choose a few different strains in one order. Shipping was fast, with my package arriving 48 hours after my order. The packaging is simple in a resealable bag, labeled with generic labeling. The customer service was great; I received all of the usual follow up emails with the status of my order. When the order was shipped I received an email with my tracking number. I ordered late in the evening, and received a response for my order being shipped in the morning. The turnaround time was great, and I didn’t have to deal with anyone directly because there were no issues. One thing I thought would have been great is additional discounts for my next order, fortunately they run regular promos. I ordered the 4 Strain 1kg variety pack. I received 250 gram of each Red Maeng Da, Green Maeng Da, Gold Bali and White Maeng Da. My favourite strain of kratom is Red Maeng Da; this strain is very relaxing and the aromatics put me right to sleep. The product is all lab tested here in Canada, and straight from the source (confirmed with business representatives) Furthermore, the product quality is second to none & 100% Organic. As we have mentioned previously, prices are pretty standard for most online kratom shops. Canada Kratom Store does have great prices, and some better deals though. 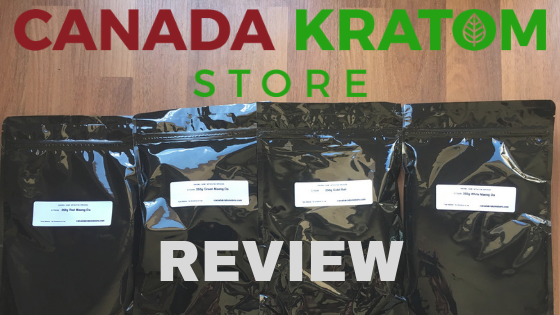 The unique part of Canada Kratom store is their selection and the quality of the product. Canada Kratom Store has a proprietary extract. This store is definitely worth the visit. With the highest quality of Kratom in Canada, straight from the source, with prices that can’t be beat. The website is clean, and the business owner’s know what they are doing when it comes to running an online store and treating their customers. Unfortunately there is not much supplemental information on their site about the product, but this is to be expected for the aromatic herb. The shipping is fast and there are regular discounts at their shop. Check them out today and select your strains. Just ordered from them! Thanks for the review. So far the customer service has been amazing. I placed an order based on your review. They have a C.O.D. option which I used. I will follow up with a review of the three strains I purchased once I have spent time with them. Awesome customer service, fast delivery. Love the products. Making blends and it’s great. More info would be awesome but hey a little handout with it maybe? ?